We do not warrant the accuracy, completeness, currency, or reliability of any of the content or data found on this site and we disclaim all warranties and conditions, including implied warranties and conditions or satisfactory quality, fitness for a particular purpose and non-infringement. Due to the inherent risks in using the internet, we cannot be liable for any damage to, or viruses that may infect, your computer equipment or other property when using or browsing the site or when downloading any data, text, images, video or audio from the site or sending any e-postcards we shall not be liable for any loss, claim, damage, or any punitive, indirect, incidental or consequential damages of any kind (including but not limited to lost profits or lost savings or loss or corruption of data) whether based in contract, tort, strict liability, or otherwise, which arises out of or is in any way connected with (i) any use of this site or its contents, (ii) any failure or delay in the use of or inability to use any component of the site and (iii) any information, software, products, services and related graphics obtained through the site in all cases even if we have been forewarned of such loss or damage. We may provide links to other sites, resources, advertisements or sponsorships either directly or through our contractual partners. We accept no responsibility for these links and do not endorse their contents. If you decide to access other web sites or have any dealings with third parties, you do so at your own risk. © Hoka Hey Motorcycle Challenge™. All rights reserved. 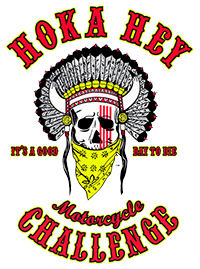 Hoka Hey Motorcycle Challenge and the Hoka Hey Motorcycle Challenge logo are registered trademarks and are licensed for use solely by the Medicine Show LLC. All logos and designs on this Web site are trademark-protected (TM). Copying and any other use of images are not allowed.